There are many ways you can use this tag. I have included a few here. It would be a great for a teacher, school, church class etc. The circle punch I used is the Uchida LV-XGCP40 Clever Lever Extra-Giga Craft Punch, Circle it measures 3 1/2 inches. My favorite punch EVER! You can put a bag of Starburst candy into a nice container, or simply as I have posted here. Its a great/fun gift for all different occasions. Silly- but still fun to receive. I created this for father’s day in mind- but I know I will need it again soon. I am sharing all the versions I came up with this week with you YAY FOR SHARING!! 72 Comments - Leave a comment! These are so so cute!!! 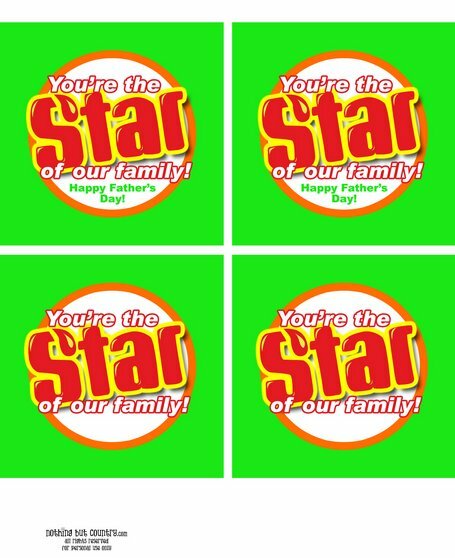 I hope this isn’t too bold but would you consider doing one that just says “You’re the Star” so it would fit even more occasions? Thank you so much for your generosity. It is much appreciated. Those are great!! You are so talented!! OH MY GOSH!!! Awesome!!! You are so darn creative!!! What a great idea! I love how versatile this one is and anyone would love it. Thanks for sharing it! I wanna wake up with one of these things everyday. Cuz you know what? Something like that would make us all feel like stars. Good on ya for that one! cute printable! I am amazed at those who are able to create the graphic art! this is so cute too!!! This is such a great idea. I can already think of tons of ways to use it! Thanks so much for sharing! Hi, I love this idea!!! 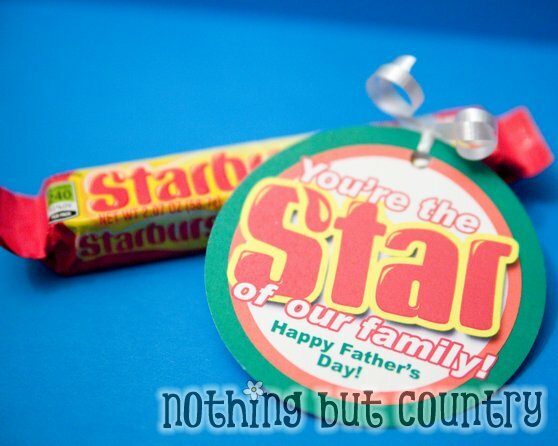 Where can I find this Starburst font? I would love to make one for my cheerleaders in the Fall! Thanks so much! SO SO SO Cute!! I wanted to do this for my daughters volleyball team!! Any chance to get one with “of our team!” on the bottom?? You are amazingly talented!! lesaward1@hotmail.com if there is any chance to get this?? Love, love, love these!! I am using these for my son’s therapists. Thank you so much for the great idea and printable. Sooo cute!! Already printed mune.. thanks so much! I wondered if you ever did one without anything on the bottom, just “you are a star”? LOVE this and would also love to see “You’re The Star” or “You’re A Star”! Our school’s girls soccer team just won a State title! 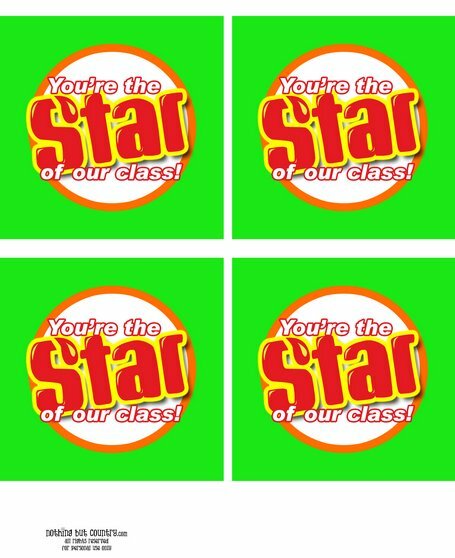 We are so excited and I wanted to make one of these “You’re a STAR” labels for one of the girls on the soccer team for her soccer banquet. Is there anyway you could please email me the art for this? I would really appreciate your help. Enjoy! From your STAR of the week! Love what you’ve done with this cute craft. My daughter’s on a drill team and I would love to hand these out as spirit gifts. Is there anyway you could send me the You’re the Star of our Team tag, please? Thanks & you’re definitely the star of this craft! You’re the Star of our Team. Hi! 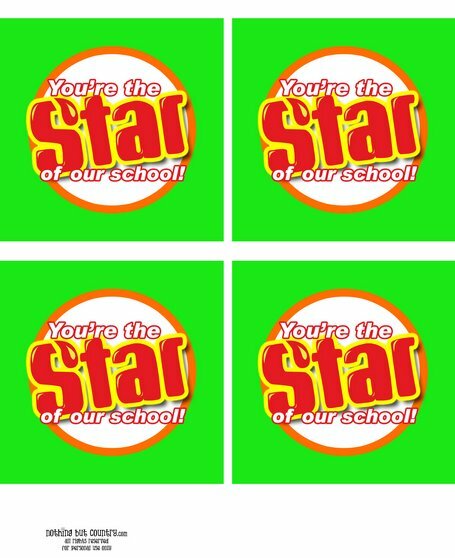 This is a really cute idea = )I would love to have a printable tag that reads “You’re a Star” for all of our preschool teachers! Are you able to email this to me? I would really appreciate it! This is so cute! Need to use it for my employee week. Please tell me where caI can get this font? did anyone receive a response or a fil for just “You’re a Star” by itself? Teacher Appreciation Week 5/6 Through 5/10 – Are you Ready? I love this! I’m trying to download both the class and school one but site is temoraly down. Can u email me the jpeg please???? SUPER fantastic!! Off to create!!! Thanks for being GREAT! Thank you so much for the terrific freebies! So cute! we just made these for our teachers and they LOVED them!! Such a great idea. These are beautiful tags! I would definitely use them if they only read “You’re a Star”. Keep us all posted if you create something like that! These are so cute! I love all your crafts. 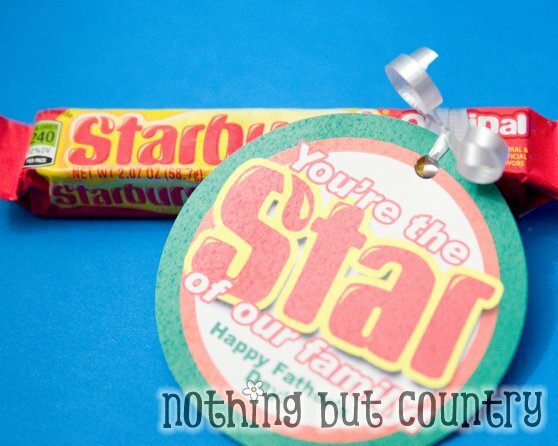 I wanted to make my own starburst gift, where did you get the Starburst font. I am a dance teacher and wanted to make one that said: You’re a STAR, BURSTing onto the stage! id like one that says youre the star of our TEAM as well! thank you! Love your idea…several asked if you’d make a printable with simply, “You’re a Star”….wondering if that’s something you did and, if so, might I have access to you?? Lots of dance recitals coming up on my calendar and that would be perfect. Please advise and thanks so much for sharing! So adorable!! I see that people have requested different sayings but I am not sure if you even take requests. If so, I would love a printable that says, “Thanks for being a STAR teacher!” Please let me know if you take requests or not Thanks for your creative ideas! Love it! I wanted to do this for my daughters volleyball team! Any chance to get one with the word TEAM? I have looked through your entire site and I must say, you are so creative. Kudos to you!